VANCE, Zebulon Baird, (nephew of Robert Brank Vance [1793-1827] and brother of Robert Brank Vance [1828-1899]), a Representative and a Senator from North Carolina; born on Reems Creek, near Asheville, Buncombe County, N.C., May 13, 1830; attended the common schools of Buncombe County, and Washington (Tenn.) College; studied law at the University of North Carolina at Chapel Hill; admitted to the bar in 1852 and commenced practice in Asheville, N.C.; elected prosecuting attorney of Buncombe County in 1852; member, State house of commons 1854; elected as a Democrat to the Thirty-fifth Congress to fill the vacancy caused by the resignation of Thomas Lanier Clingman; reelected to the Thirty-sixth Congress and served from December 7, 1858, to March 3, 1861; during the Civil War entered the Confederate Army as a captain and was promoted to the rank of colonel (26th North Carolina Infantry Regiment); elected Governor of North Carolina in 1862, and reelected in 1864; removed from office in 1865 when he was arrested and imprisoned in Washington, D.C. for Confederate activities; elected as a Democrat to the United States Senate in November 1870, but did not present his credentials; unsuccessful Democratic candidate for election to the United States Senate in 1872; Governor of North Carolina 1876-1878; elected as a Democrat to the United States Senate in 1879; reelected in 1884 and 1890, and served from March 4, 1879, until his death; chairman, Committee on Enrolled Bills (Forty-sixth Congress), Committee on Privileges and Elections (Fifty-third Congress); died in Washington, D.C., April 14, 1894; funeral services were held in the Chamber of the United States Senate; interment in Riverside Cemetery, Asheville, N.C. Recommended Reading: Zeb Vance: North Carolina's Civil War Governor and Gilded Age Political Leader (Hardcover: 528 pages) (The University of North Carolina Press). Description: In this comprehensive biography of the man who led North Carolina through the Civil War and, as a U.S. senator from 1878 to 1894, served as the state's leading spokesman, Gordon McKinney presents Zebulon Baird Vance (1830-94) as a far more complex figure than has been previously recognized. Vance campaigned to keep North Carolina in the Union, but after Southern troops fired on Fort Sumter, he joined the army and rose to the rank of colonel. He was viewed as a champion of individual rights and enjoyed great popularity among voters. But McKinney demonstrates that Vance was not as progressive as earlier biographers suggest. 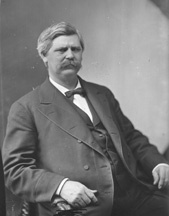 Vance was a tireless advocate for white North Carolinians in the Reconstruction Period, and his policies and positions often favored the rich and powerful. McKinney provides significant new information about Vance's third governorship, his senatorial career, and his role in the origins of the modern Democratic Party in North Carolina. This new biography offers the fullest, most complete understanding yet of a legendary North Carolina leader. Recommended Reading: War Governor of the South: North Carolina's Zeb Vance in the Confederacy (New Perspectives on the History of the South) (Hardcover: 288 pages) (University Press of Florida). Description: Zebulon B. Vance, governor of North Carolina during the devastating years of the Civil War, has long sparked controversy and spirited political comment among scholars. He has been portrayed as a loyal Confederate, viciously characterized as one of the principal causes of the Confederate defeat, and called “the Lincoln of the South.” Joe A. Mobley clarifies the nature of Vance’s leadership, focusing on the young governor’s commitment to Southern independence, military and administrative decisions, and personality clashes with President Jefferson Davis. Continued below. As a confirmed Unionist before the outbreak of the war, Vance endorsed secession reluctantly. Elected governor in 1862, Vance managed to hold together the state, which was divided over support for the war and for a central government in Richmond. Mobley reveals him as a man conflicted by his prewar Unionist beliefs and the necessity to lead the North Carolina war effort while contending with widespread fears created by Lincoln’s Emancipation Proclamation and such issues as the role of women in the war, lawlessness and desertion among the troops, the importance of the state’s blockade-runners, and the arrival of Sherman’s troops. While the governor’s temperament and sensitivity to any perceived slight to him - or his state - made negotiations between Raleigh and Richmond difficult; Mobley shows that in the end, Vance fully supported the attempt to achieve southern independence. Recommended Reading: The South Was Right! (Hardcover). Description: Kin Hubbard said "'Tain't what a man don't know that hurts him; it's what he does know that just ain't so." Much of what people "know" about the causes, conduct, and consequences of the Civil War "just ain't so." The Kennedy brothers make a strong case that the real reasons and results of the War Between the States have been buried under the myth of Father Abraham and his blue-clad saints marching south to save the Union and free the slaves. Sure, the tone is polemical. But the "enlightened" elements of American opinion have been engaging in a polemic against the South and its people for decades… This book adopts the "following the money approach" to analyzing who profited most from slavery – a convincing argument that reflects that much of the wealth went to the North. It also points out that slavery was not new to Africa, and was practiced by Africans against Africans without foreign intervention. A strong case is made that the North and Lincoln held strong racist views. Continued below.